Why is higher education seeing a big rise in FOI requests? 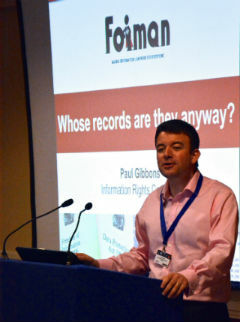 FOIMan puts a report on FOI from Times Higher Education into context. begins a piece in this week’s Times Higher Education. Readers who’ve been following this blog for a long time (ie for the last month) will remember that I used to be an FOI Officer for a higher education institution, so this article caught my eye. Certainly my experience in a small college of the University of London supports these findings. Up to the point that I left in December we had received almost 150 requests. When I joined SOAS in 2010, the number was 69. Not long before it was less than 50. SOAS is a fairly small institution and doesn’t always get included in the “round-robin” requests sent to universities so the impact will be even greater in other institutions. THE cite York (home of the largest plastic bottomed lake in Western Europe, fact fans) as receiving 416 requests in 2013. So why is this happening? Well, as a recently demobbed Higher Ed FOI Officer I can offer some educated guesses. Some have pointed to the number of requests being made by student journalists. Certainly a large proportion of the requests I dealt with in the last 6 months (which was primarily when the increase happened in 2013) came from that demographic. The reason for this sudden burst in activity? Well, anecdotally there is speculation that university journalism courses are setting assessments requiring students to make FOI requests. Is this ethical? Personally, I don’t have a problem with it if the students are uncovering useful information in the public interest, but if it is merely a box-ticking exercise as part of a course, then I think course convenors ought to be asking themselves if there is a better way to educate students in the use of FOI. 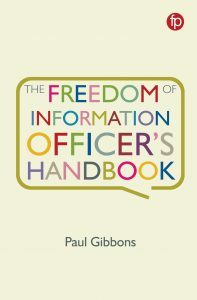 And perhaps asking FOI Officers in their own organisations to assist in developing courses which empasise that FOI should be used responsibly and as part of wider research employing a range of techniques. The other reason that I think universities are seeing increased levels of requests is to do with the maturity of the legislation. When I worked in the NHS, the levels of FOI requests were first of all low compared to my experience in local government. But shortly after I joined the Trust in question (in 2009), the numbers started to rocket. And now we see the same happening in universities. (An alternative theory is that it’s my fault, but as this is happening across the country, I think we should probably discount that). What appears to be happening is that awareness that particular areas are subject to FOI increases over time. In 2005, everybody knew that central and local government were subject to the Act and wanted to try it out to dig out political stories. As time has gone on, people have become more aware that other areas are covered, and what’s more their use of the Act has become more sophisticated. Now it is common practice for journalists and others to send FOI requests to a number of institutions to compare the results, so numbers across a whole sector rise. It is also worth noting that higher education has been in the news a lot more in recent years due to tuition fees and other government reforms. (A mischievous element in me wonders whether the fuss Universities UK made in 2012 in its attempt to influence the post-legislative scrutiny may have backfired rather magnificently). So my theory is that the rise in requests is partly due to a novel development (students being given FOI requests as homework), partly just the natural evolution of FOI awareness, and partly higher education drawing more attention to itself. The THE article was based on an FOI request submitted to higher education institutions in December. I remember it well as it was one of the last that I answered before I left. It asked for the numbers of requests submitted over each of the last 3 years, together with the numbers answered late, how many had been refused and how many times each exemption had been used. As well as reporting on the rise in requests, THE has been pretty scathing both in the main article and in a withering editorial about universities’ attitudes to FOI based on both their experience with the response to this particular request and on the statistics disclosed. Whilst in the past I have been the first to draw attention to skepticism in higher education about FOI, I do think the THE criticism on this occasion is unfair. Firstly, I think THE’s methodology meant that the likelihood of receiving a complete set of useful responses was minimised. 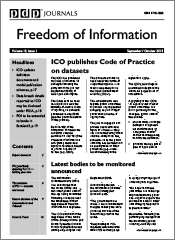 If you want to find out how a public body performed under FOI in a calendar year, complete figures will not be available until February of the following year at the earliest (this is a matter of pure mathematics – the last day that counts for this purpose is 31 December, so 20 working days after that, taking into account all UK bank holidays, will be in early February). Furthermore, although public bodies are obliged to answer requests within 20 working days, practical obstacles do sometimes make that difficult. If you make an FOI request in December to institutions that tend to close over the Christmas period, then perhaps it isn’t so surprising if those institutions struggle to meet a deadline, especially if you are also aware that they are experiencing a significant spike in workload. If the same request had been made in March, say, the journalist would have received many more responses on time and complete data from each responding institution. THE also claimed that a lot of universities didn’t provide all the information. Certainly I didn’t. I pointed the journalist in the direction of published data (not just for my university but for several) which provided everything he wanted for 2011 and 2012, citing the exemption for information that is readily available (s.21). I also cited s.22 – future publication – for the 2013 figures as they will also be made available when complete (arguably I could also just have said that we didn’t hold the information given that it wasn’t yet complete). I did provide an interim total for the requests received. No doubt this counted as a refusal for the purposes of the article, but I effectively provided most of what was asked for and only refused to preempt a task that will be carried out very soon. The article and the editorial make much of the fact that of those universities that provided data, there were big variations in the percentage of requests that were turned down. But there is nothing odd about this (indeed, it would be more suspicious if they were of a uniform nature). Firstly, percentages are meaningless without the numbers involved. Given that some universities had received 50 – 60 requests in 2013, and others had received many times that amount, this is an important point. Secondly, within the higher education community there is huge variation in the issues that are faced. SOAS is a humanities and social sciences college, so won’t hold information on scientific or medical research or have any of the issues associated with that research. Some universities have major collaborations with the private sector whilst others don’t. It may cost larger universities more to locate information as it is spread over a larger geographical area and in more places. Smaller universities may have less resources to establish systems to manage their information better and therefore bring the cost of retrieval beneath the appropriate limit. And so on. There are many and varied reasons why different universities might be more inclined to withhold information than others. There’s no need for a conspiracy theory to explain these variations. (The ICO, asked to comment, said more or less the same thing). I welcome journalists scrutinizing the performance of public bodies in complying with FOI, and also highlighting the growing pressures that are faced by those tasked with managing FOI requests. But if the methodology used is flawed, and the conclusions made hyperbolic, there is a risk that far from encouraging a positive approach to FOI, skepticism about FOI within public bodies will grow. Paul, I just want to challenge your Maths regarding due dates, an FOI received on 31 December 2013 would be due on 30 January by my reckoning, not in February, a minor point but an important one even so. Other than that you raise some valid points that apply across the public sector and not just HE/FE. Requestors need to realise there is no one size fits all as every authority has their own circumstances and what authority A can/can’t do is of no relevance to similar authority B.
You’re absolutely right, though as you suggest, it doesn’t make any difference to the central point – there’s little point asking for 2013 stats in December of that year if you’re conducting a serious study, as they won’t be complete until some time into the following year. It’s very unlikely that any public authority would have finalised their stats before the beginning of February. Glad you liked the post though!